The aim of this module is to explore curriculum making methodology. 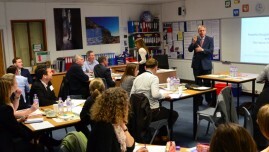 Curriculum making underpins curriculum leadership. Curriculum leadership exists within teachers’ own classrooms. Some teachers may become curriculum developers. For example, they may write a text book. This important function (development and/or design) can take place away from the geography classroom. GeoCapabilities is concerned with teachers as curriculum makers. This underpins their curriculum leadership. Realise the significance of ‘curriculum’ and its conceptual difference from (and relationship to) ‘pedagogy’. Understand the creative and practical task of curriculum making. Appreciate the significance of well chosen ‘curriculum artefacts’. Understand the role of curriculum making in achieving a Future 3 geography curriculum. Participants should produce their own exemplars or case studies of curriculum making in action. This means creating and sharing curriculum artefacts. how to interpret what pupils do with the materials and experiences we provide – that is, how they respond. It is possible to show all the above using a well-chosen artefact as the main focus. This module provides examples of how to do this.